[S1700] PFC Earl Charles Bagwell Grave Stone, Find a Grave, www.findagrave.com. [S948] Jr George Oscar Bagwell Grave Stone, Find a Grave, www.findagrave.com. Child of Ronald W. Bagwell Jr.
Agnes Elizabeth Morrison was also known as Elizabeth Morrison. She was born on 11 August 1814 in Iredell County, North Carolina.2 She married Lorenzo Dow Bagwell, son of Nathaniel Bagwell and Margaret McConnell, after 31 October 1838. As of after 31 October 1838,her married name was Bagwell. Agnes Elizabeth Morrison died on 6 January 1897 in Alexander County, North Carolina, at age 82.2 She was buried at Rocky Springs United Methodist Church Cemetery, Hiddenite, Alexander County, North Carolina. James S. Perry was born circa 1839. He married Amanda R. Bagwell, daughter of Lorenzo Dow Bagwell and Agnes Elizabeth Morrison, after 1850. Thomas Archibald Bagwell was born on 9 November 1846 in Rocky Springs, Alexander County, North Carolina.1 He was the son of Lorenzo Dow Bagwell and Agnes Elizabeth Morrison. Served as an unassigned conscript from North Carolina for the Confederate Army. Thomas Archibald Bagwell died on 23 September 1864 in Camp Douglas, Illinois, at age 17 Camp Douglas was a Union training camp and later prisoner-of-war camp in Chicago, Illinois, USA, during the American Civil War. In 1861, a tract of land at 31st Street and Cottage Grove Avenue in Chicago was provided by the estate of Stephen A. Douglas for a Union Army training post on the original site of the first University of Chicago. The first Confederate prisoners of war, more than 7,000 from the capture of Fort Donelson in Tennessee, arrived in February 1862 by the Illinois Central railroad which ran along the shore of Lake Michigan just to the east of the camp. Eventually, over 26,000 Confederate soldiers passed through the prison camp, which eventually came to be known as the North's "Andersonville" for its inhumane conditions. It is estimated that from 1862–1865, more than 6,000 Confederate prisoners died from disease, starvation, and the bitter cold winters (although as many as 1,500 were reported as "unaccounted" for). The largest number of prisoners held at any one time was 12,000 in December, 1864. Accounts vary as to precise numbers. According to 80 Acres of Hell, a television documentary produced by the A&E Network and the The History Channel, the reason for the uncertainty is that many records were intentionally destroyed after the war. The documentary also alleges that, for a period of time, the camp contracted with an unscrupulous undertaker who sold some of the bodies of Confederate prisoners to medical schools and had the rest buried in shallow graves without coffins. Some were even dumped in Lake Michigan only to wash up on its shores. Many, however, were initially buried in unmarked pauper's graves in Chicago's City Cemetery (located on the site of today's Lincoln Park), but in 1867 were reinterred at what is now known as Confederate Mound in Oak Woods Cemetery (5 miles south of the former Camp Douglas). Nobody was ever held accountable for the conditions and actions at Camp Douglas, in fact the only Union general to gain the rank without seeing combat was an overseer of Camp Douglas. This is also to this date the largest mass grave in the western hemisphere, as documented by the book To Die in Chicago. Henry Whitney Bellows, president of the U.S. Sanitary Commission, wrote to Colonel Hoffman his superior after visiting the camp: "Sir, the amount of standing water, unpoliced grounds, of foul sinks, of unventilated and crowded barracks, of general disorder, of soil reeking miasmatic accretions, of rotten bones and emptying of camp kettles, is enough to drive a sanitarian to despair. I hope that no thought will be entertained of mending matters. The absolute abandonment of the spot seems to be the only judicious course, I do not believe that any amount of drainage would purge that soil loaded with accumulated filth or those barracks fetid with two stories of vermin and animal exhalations. Nothing but fire can cleanse them." (in the documentary 80 Acres of Hell). According to the History Channel documentary, the commander before Sweet imposed the following harsh conditions: 3oz daily meat portions, sitting naked in the winter, crippling sittings on a sawhorse device, and beating or shooting of those trying to circumvent food rations — even, for example, to punish the eating of snow. During Colonel B.J. Sweet's command of Camp Douglas, he used reduced food rations — removing vegetables and decreasing the 3oz daily meat portions — to control the prison population and reduce escape attempt numbers. The reduced rations increased instances of diseases such as scurvy and helped to increase mortality rates. Sweet rewarded guards for shooting prisoners, restricted prisoner movement, and enforced nightly quiet hours. Acting on rumors of a pre-election Camp Douglas Conspiracy to break prisoners free, Sweet extended martial law from the blocks surrounding Camp Douglas to the city of Chicago and arrests about a hundred citizens suspected of treason (reference: 80 Acres of Hell). Prisoners were tortured to try to extract information. Prisoners were hung by their thumbs or forced to ride the "wooden horse" or "mule", with weight hung on their feet to make the experience more painful (reference: 80 Acres of Hell).1 He was buried at Oak Woods Cemetery, Chicago, Cook County, Illinois; Died at Camp Douglas, Illinois on December 23, 1864, at the age of 18. William Morrison Bagwell was born on 13 March 1854 in Rocky Springs, Alexander County, North Carolina. He was the son of Lorenzo Dow Bagwell and Agnes Elizabeth Morrison. 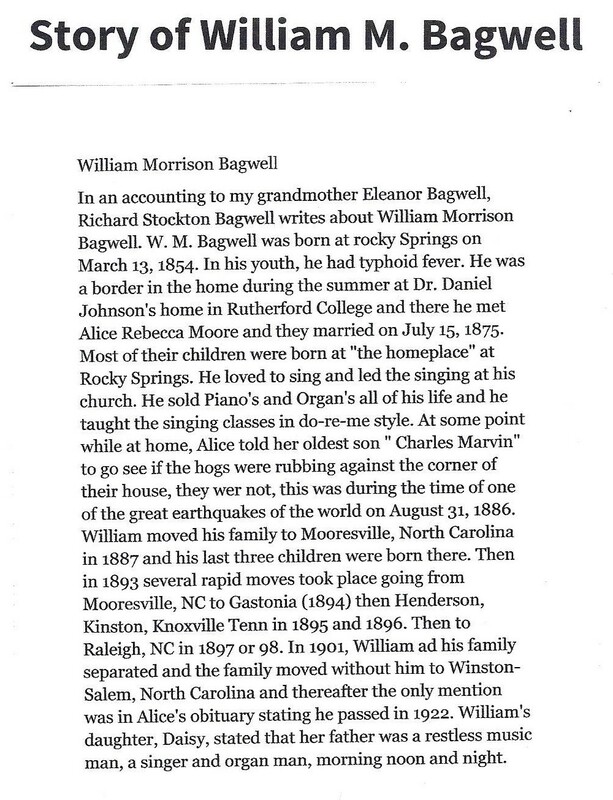 William Morrison Bagwell married Alice Rebecca Moore on 15 July 1875 at Burke County, North Carolina. William Morrison Bagwell married Elizabeth K. Quartermus on 17 April 1902 at Martin, North Carolina. William Morrison Bagwell died from 1920 to 1922 in Alexander County, North Carolina. Alice Rebecca Moore was born on 1 January 1857 in Johnson County, Tennessee. She married William Morrison Bagwell, son of Lorenzo Dow Bagwell and Agnes Elizabeth Morrison, on 15 July 1875 at Burke County, North Carolina. 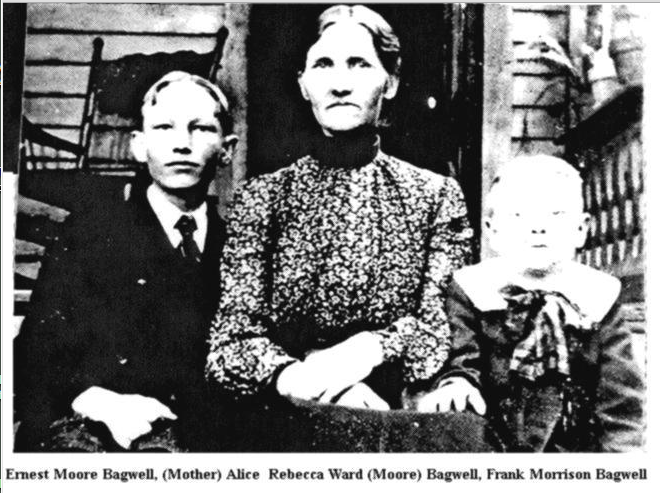 As of 15 July 1875,her married name was Bagwell. Alice Rebecca Moore died on 2 July 1934 in Winston-Salem, Forsyth County, North Carolina, at age 77. She was buried at Salem Cemetery, Winston-Salem, Forsyth County, North Carolina. [S1540] Indiana Registration Location: Marion County, WW I Draft Registration Card: John Morrison Bagwell, Roll: 1504019; Draft Board: 5. [S952] Email from Andy Bagwell dated September 2009 to David Bagwell - Subject Line: Andy Bagwell Family History. Josiah Walter Bagwell Jr. is the son of Josiah Walter Bagwell and Margaret McIntosh. Child of Josiah Walter Bagwell Jr.
[S1815] United States Federal Census, Washington, District of Columbia, Population Schedule: Spartanburg, Spartanburg, South Carolina; Enumeration District: 149; Supervisor District: 1; Page: 68, Dwelling: 602, Family Number: 705, Date: 1880. Lilla Bunola Bagwell was born on 18 February 1872. She was the daughter of Josiah W. Bagwell and Melvina Elizabeth Lockman. Lilla Bunola Bagwell died on 16 March 1872.